Don’t be surprised if your toddler is dry all day, but wet at night much longer. Day training and night training are completely different things, and for a child to be dry at night, the nerve pathways between the bladder and the brain have to become better developed. This means your little one must also be motivated (and brave) enough to climb out of a cozy, warm bed at night to venture out — alone — into the dark bathroom. On top of that, his body may not yet have developed the nighttime slowdown in urine production that naturally develops anywhere from ages 2 to 7. This has little to do with your child’s potty personality — rather, it is likely genetic and often takes longer in very deep sleepers. Many young children, especially ones who are very active during the daytime, sleep so deeply at night that they’re difficult (or impossible) to awaken. That’s why day training and night training are two completely different animals. How will you know if your child is ready to try sleeping with just pajamas? She might be ready when she starts to wake up dry from her nap, or you might notice she isn't as wet as she used to be in the morning. Then, you can talk about her growing body to see if she’s interested in trying to sleep without the Pull-Ups®. 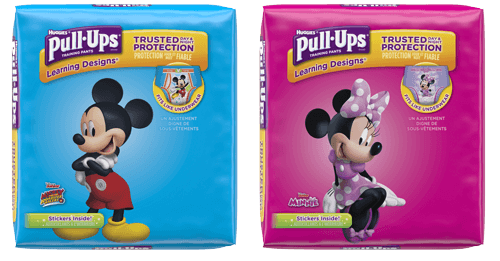 Feel free to experiment as soon as she’s ready — you’ll both know you have Pull-Ups® Night*Time training pants handy if she’s just not ready yet. This phase is particularly hard on both parents’ AND kiddos’ nighttime sleep habits, if there’s a lot of concern about wetting the bed. If she’s just not ready, try again in a few weeks. Everyone’s sleep is much more important than forcing nighttime dryness in a child who’s not yet ready. In the meantime, try using GoodNites® Bed Mats as a simple way to give your child restful nights and help you cut down on sheet changes. Potty Training vs. Bedwetting — What's the Difference?